Ryan Stefiuk in February 2008 on Blow Me Down Mountain near Frenchman's Cove—one of the few cliffs sanctioned for publication by the developers of Newfoundland ice climbing. New Englanders Stefiuk and Alden Pellet traveled to the area visited by Menard and Mongrain a few weeks after the Canadian pair. "Locals knew of no one who had climbed the three obvious steep routes on this face [that we climbed],"says Pellet. "It's possible this was an FA—but who knows?" THE ICE-CLIMBING POTENTIAL IN NEWFOUNDLAND is obvious. Any climber could look at the cliffs and waterfalls in a tourism brochure and extrapolate winter from there. And many have: tales of Newfoundland as a frozen mini-paradise have long circulated in ice-climbing circles. Little, however, has ever been officially recorded or reported—and in the last few months of Winter 2007-'08, the resulting confusion became news in its own right. In January 2008, sparked by Christmas cheer and a distant memory of a friend's slides, Louis-Philippe "LP" Menard and Yan Mongrain, two young, strong Quebecois climbers, decided to go questing in Newfoundland for unclimbed ice. It was a whimsical plan: they bought topo maps at the last minute, stuffed their car with expedition gear and headed for the ferry crossing. Once in the Long Range Mountains, Menard and Mongrain broke trail away from the place their friend had climbed and toward some other steep contour lines on their map. Though they had "no particular expectation," they did have a goal: "exploring and trying to find some wicked-remote big wall with virgin ice lines." Which they did, or so they thought, when they happened upon a large, steep wall and opened "two major first ascents": Python Givre (Frozen Python: VI WI6+, 250m) and Gadoue Sauvage (Wild Slush: V WI5 M7, 250m). Back at home, Menard was jacked to share the news. Following communication protocols of the MySpace generation, he emailed a trip report and some pictures to his friends. And, because first ascents are news, he emailed a report to his sponsors and to media outlets like alpinist.com. First ascents are critical to climbers, steering our evolution and motivating us to push physical limits and explore new places. As Menard notes, "It's a big world. So much has not been explored. Why hide what has already been discovered?" Why indeed? A week after sending out his trip report, Menard got a newsworthy email himself. Frozen Python and Wild Slush had already been climbed, rated and named, as Baby Beaver (WI5 M6+, 250m) and Tundering Lard (WI5+ M5, 250m). The wall was called the Cholesterol Wall. Soon the comments on the alpinist.com report exceeded the length of the report itself. As it turns out, Menard and Mongrain had unwittingly stepped into a gigantic Petri dish cultivating a rare strain of ethics. The masterminds of this experiment (who wish to remain unidentified; we'll call them the Climbologists) wanted to see how a place would develop if allowed to grow organically rather than undergo the fertilization of publicity and promotion. It's not that the Climbologists didn't talk about the routes in their dish. They did. They've been exploring and opening new routes in Newfoundland every year for more than a decade. In fact, to many in the Anglo climbing know, their names are synonymous with Newfoundland ice. They spoke of their adventures and routes with friends. They even talked about Newfoundland in slide shows at forums like The American Alpine Club's annual meeting and Mountainfest in Keene Valley. But, like a loose-fitting cover, they capped their words short of publication. Menard and Mongrain, French-speaking Canadians who travel in different climbing circles, had never heard of the Climbologists' experiment until they unwittingly staked claim on their unrecorded routes by reporting them as new. Then, the Climbologists let loose with emails and calls to the Alpinist offices, complaining that the Quebecois had erroneously reported previously established lines. IT'S NOT UNCOMMON to keep a crag quiet until all the lines are harvested: witness any number of tight-lipped bolting parties slinking off to Idaho's White Mountains or ducking up to yet another newly discovered choss heap in the overrun Wasatch. It's also not unusual to keep entire ranges or regions quiet. The "don't publish" ethic has dominated the Dirty Sox Club's approach regarding a certain range in Montana for decades. Their reasons for secrecy seem to be the same as those of the Climbologists: preserving the environment—and a secluded atmosphere for themselves. But how does one simultaneously keep an area quiet—and justify indignation when the unreported lines get claimed as new routes—without inviting charges of hypocrisy? Menard and Mongrain were not the first to wander into this conundrum. When Bernard Mailhot, another avid, accomplished ice climber from Quebec, went to work in Newfoundland in 2002, he wasted no time scoping out the potential. In the fall, he found a couple of local ice climbing partners and, after an extensive search, some minimal climbing records. He did a few good routes, got a taste of the crux of Newfie ice climbing—logistics—and then treated himself to three hours in a Cessna. He exited the plane crazed by what he had seen. Eventually, he found a willing local with a skidoo and recruited two ice climbing buddies from Quebec. Mailhot and his partners started up a 700-meter line with no reason to believe it had previously been climbed. On the way, they bolted a thin belay and placed one lead bolt—liberal bolting by some standards, but Mailhot had been influenced by accusations that some of his bolder routes did not properly accomodate future ascents. Then, on the seventh pitch, they found a two-pin belay. Doh! Later, after writing someone peripherally in the know, Mailhot received a note from the head Climbologist , who threatened to chop his bolts. After some discussion the pair agreed, vaguely, to post a register at "someplace like a gas station" to avoid a repeat of Mailhot's "mistake." But neither party followed through on the idea, which left the route open to yet more future "first ascents." CLIMBERS WHO ACTIVELY WORK TO SUPPRESS NEWS about a place may of course vastly overestimate both its quality and its potential popularity. The stomping ground of the Dirty Sox Club is not some untrammeled version of the Bugaboos; rather, its 1,500-foot walls are notorious for bad rock and nasty approaches. The same might be true for Newfoundland. 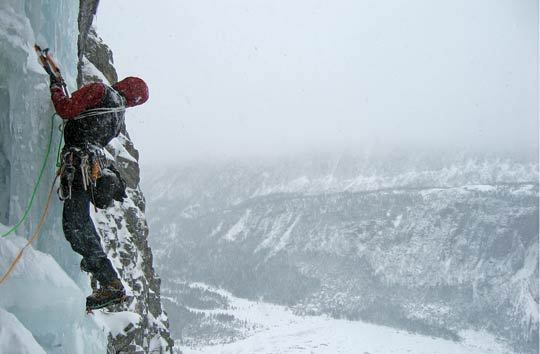 In 1997, Tim Auger, then Banff Park Warden Rescue Specialist, traveled to the province to help assess whether a climbing plan might be needed for an onslaught of potential ice climbers. He concluded that although the ice was promising and plentiful, the logistics of approaches and the atrocious Atlantic coastal weather would keep most away. Natural circumstances may protect the Climbologists' domain after all. Experiments like the one in Newfoundland are in many ways a refreshing alternative to the hyped-up publication of every climb and every problem prevalent in today's climbing. An ethic that maintains a silence as pure as an unmarked wall can have an austere beauty—one that the community treasures, as evidenced by a legend involving a climbing icon. As the story goes, in 1989, Mugs Stump had just returned from one of his favorite places: the Alaska Range's Ruth Gorge. He sat in a dark corner of Talkeetna's Fairview Inn, sipping from his beer and recollecting a climb that to him had been nearly perfect: solo, onsight, with no physical evidence of his passage left behind. While he enjoyed his drink, he overheard a party of climbers talking loudly about the Ruth. The conversation grew in enthusiasm and volume, drifting toward the route he had just climbed, then fixing on it and reaching a crescendo. A smile played at the corners of his lips. He finished his last sip, put the beer down and walked out into the Alaskan night without saying a word. What is the perfect climb? For some, it will always be Stump's ideal: a bold, exploratory line done in irreproachable style, with no fanfare, spin or hype. Others will choose to publicize their routes; the reasons for doing so will vary as greatly as the reactions to their choices. In the end, nobody is regent of the mountains, with the power to decree what qualities comprise the heart of our pursuit. But if someone decides not to report, it's difficult to justify public umbrage when other, less taciturn climbers send the routes and then declare them as their own. After all, you can't have your beer and drink it too.